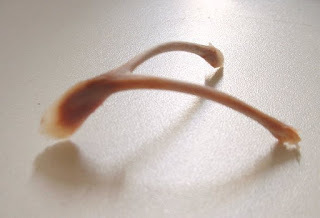 Everyone knows that a wish made by either of two individuals prior to the interaction of these two in pulling on opposite ends of a chicken's wishbone will be fulfilled for the individual with a lucky break, namely, the one who breaks off the longer portion of bone. This is obviously magical thinking. Therefore, I always wish to lose. If the purported magic were real, my wish would surely result in some dire consequence from the magic being set at odds with itself, but since absolutely nothing happens, I conclude that the purported magic is merely purported, not real. Just stating the obvious, but that's sometimes all I can do . . .
To us Arkies, the wishbone is called the Pulley Bone (for sure within a mile radius of the Flora Baptist Church). I cannot use the verbiage "Wishbone" at my advanced age...G'Ma Nora called that particular cut the Pulley Bone, and she knew a bit about chickens. I defer to your greater knowledge . . . and to my distant memory of the truth. Thanks...appreciate the compliment, however the man with "knowledge" resides in Seoul! Well, everybody's an expert on something . . . I'm still looking for field of expertise. I'm not altogether sure, but maybe chicken bones don't count? You have to use a turkey bone. Just imagine the disruption of forces that bird would unleash! Korea expecting too much from its writers?